The surfaces of the inner planets have been swept clean by the violent onslaught of the dark legion's monstrous hordes and undead soldiers. In the enormous cities of the distant future, heretics devoted to the destruction of mankind stalk the dark backstreets and gloomy alleys spreading their teachings of greed, jealously and war. 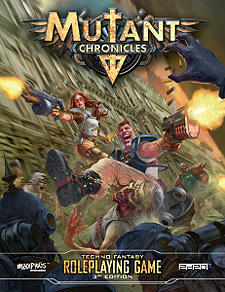 Mutant Chronicles takes you on a full-throttle diesel-punk ride through a solar system beset by corporate intrigue and the invasion of the Dark Legion. With technology failing due to the insidious effects of the Dark Symmetry, mankind must fight back against the Dark Legion hordes whilst dealing with in-fighting and conspiracy. Now, in this 3rd Edition of the definitive techno-fantasy roleplaying game, you can play during the early days of the Dark Symmetry, through to the brutal Corporate Wars. Investigate foul cults as technology turns against mankind, or fight the armies of the Dark Legion as they pour forth from citadels across the colonies in the battle for humanity's future. Never-before-seen secrets of the Mutant Chronicles universe, and maps of the solar system and Luna City. Insights into the Dark Legion Apostles and their unique forces, tactics, and plots, along with full stats for new and old monstrosities. Briefings on the major corporations, Imperial, Bauhaus, Capitol, Mishima, and Cybertronic, as well as the Cartel, the Brotherhood, and Whitestar.